You are here: Home / Blog / Uncategorized / How Do You Get to Work? It is amazing to think that Phoenix measured to be 517.9 square miles but the US Census Bureau. It is also the sixth largest city in the country due to population, only behind Philadelphia by 70,000 people yet Phoenix has less than 2,600 people per square mile where Philadelphia has upwards of 11,000. These numbers show just how spread out and big Phoenix actually is. The question of how to get around is an important one and one that state legislators are currently addressing. With Prop 104 up for vote in August, azcentral decided to test Phoenix’s current transit system. How do you get around Phoenix? The bus? Light rail? Car? Bicycle? How efficient is the current system and which mode of travel is the quickest? 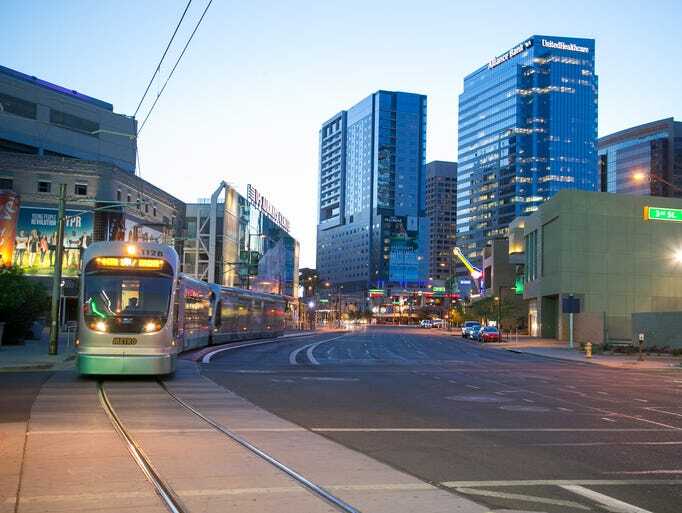 With a new Phoenix transit plan coming to the ballot in August, these are questions many people are asking. Azcentral set out to answer one of these questions: Which mode of travel in Phoenix is the quickest? To answer it, four reporters took different modes of transportation from Central Phoenix to Phoenix Sky Harbor International Airport. More on that shortly, but first some background. Prop. 104 is a 35-year, $31.5 billion, public transportation plan that includes a 0.7 percent sales tax to pay for more frequent bus service, light rail expansion, street maintenance and other transportation improvements. Phoenix transportation projects and operations would receive about $0.70 on a $100 purchase if the tax passes. Supporters of the proposal say an improved public transit system is a priority. Opponents question whether the plan is the best use of taxpayer money and whether light rail expansion is worth the cost. The 0.4 percent sales tax for the city’s current transit plan expires in 2020. If Prop. 104 passes, the new tax would take effect Jan. 1. Four azcentral reporters, Anne Ryman, Brenna Goth, Dustin Gardiner and Ricardo Cano, started at the transit station at Camelback Road and Central Avenue. Their challenge was to make their way to the Sky Train Station at 44th and Washington streets as quickly as possible. Each reporter took a different mode of transportation. Anne Ryman drove a car, Brenna Goth took the bus, Dustin Gardiner rode a Grid bike and Ricardo Cano took the light rail. Who made it to the Sky Train Station first? Who came in last? Watch the video to find out! The bus ride to the Sky Train was easier to navigate than I thought it was going to be. I probably over-prepared by planning my route online and downloading the Valley Metro app because the routes were pretty straightforward and the drivers were helpful. I made it to my destination in about an hour and ten minutes using two buses and paying $4, which will get you an all-day pass. Nearly half of my travel time seemed to be waiting for the next bus, especially when I had to change lines. Next time, I will definitely bring a hat and water for the sunny stops and short walks. I had probably the easiest assignment of the four reporters. I got to drive my Toyota Camry with air-conditioning blasting on a day when temperatures hovered in the low triple digits. MapQuest predicted the 8.8-mile route using mainly freeways would take 12 minutes. I hadn’t taken this route before to the airport before. Stop-and-go traffic from on Camelback Road to the Arizona State Route 51 slowed my trip. Once on the freeway, though, it was smooth sailing along the 51 to Loop 202. The 44th Street exit came up so quickly I almost missed it. That’s one downside of driving to the airport: You, and you alone are responsible for getting there. If you miss your exit or don’t allow enough time, it’s all on you. The trip from Central and Camelback to the Phoenix Sky Train at 44th and Washington streets took about 25 minutes. And here’s an important tip if you drop someone off at the Sky Train, I couldn’t easily find short-term parking nearby, only a cell-phone lot. I followed up with a call to the city’s parking information hotline. They say there are metered, short-term parking spaces available at 44th and Madison Street, which is just south of Washington. Bottom line: The car is a quick way to get to the airport. Just be sure and allow plenty of time for unexpected delays or if you haven’t driven that route before. Taking the light rail was smooth, inexpensive and apparently the fastest form of public transit. There was a packed crowd when I boarded, so finding a seat was a bit challenging at first. The space was a bit cramped. I didn’t expect the ride to be almost as fast as driving. When I initially volunteered to ride a rental bike from uptown Phoenix to the airport, it was a balmy afternoon in mid-May. I mean, how bad could the weather get in just a few weeks? I wasn’t feeling quite so peppy on the day of our grand transportation “experiment.” The temperature had climbed to 103 degrees by noon, when I checked out a “GR:D” Bike from the kiosk at Camelback Road and Central Avenue. As a first-time Grid Bike Share user, I was surprised how quickly I was able to register and check-out a bike. In less than two minutes, I was on a bike heading south on Central. The map on my cell phone told me the quickest route to bike to the airport would be along the Grand Canal. In a city not known fort bike-friendly streets, the canal was an ideal alternative, expect in those areas where the canal crosses major streets without a crosswalk — a hazard the city is working to fix. Ultimately, it took me about 45 minutes to bike 7.2 miles to the Sky Train entrance at the airport, with roughly a third of that time spent waiting to cross major streets. The rental cost me $26.67 — $6.67 for the ride time and $20 for an “out of system area fee” because I left the bike locked to a canal bridge guardrail near the airport. There isn’t a Grid kiosk at the airport. My advice to any regular bike commuter would be to use your own bike or ride a Grid Bike to a light-rail station and take the train the rest of the way into the airport.